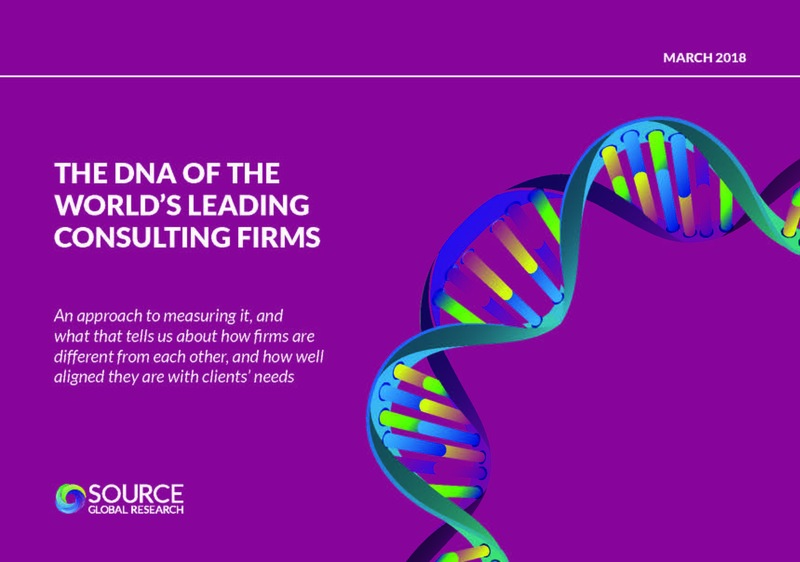 What does your firm’s DNA look like? Where do your hidden strengths and weaknesses lie? How well aligned is your DNA with what your clients want from you? This white paper represents the output of an idea about how we might approach the subject of measuring the DNA of a consulting firm. It tells us about how firms are different from each other, and how well they are aligned with client’s needs. DNA isn’t actually a thing in an organisation in the way it is in an organism, so we have to find a proxy for it. In our view, that proxy is a range of 15 attributes that we know, from our research, to be important to the clients of professional services firms. And the way to measure the existence of those attributes is to ask clients about them. The way we do that is to use a ranking system for attributes, based on how positively clients talk about them. The attribute about which they’re most positive, for a specific firm, is ranked 1; the attribute about which they’re least positive is ranked 15. The rankings then become all important: If an attribute is ranked 1 in two firms, that implies similarity of DNA. If an attribute is ranked 1 for one firm, and 15 for another, that implies a difference of DNA. We’ll do a little bit of each of those in this paper, drawing on responses about 16 of the world’s leading consulting firms.